– Talk about physical and mental burdens people of the western world face every day; briefly show the negative effects of leading an unhealthy and stressful lifestyle. – List the most popular ways for people to get rid of stress and try to keep themselves in shape. – Mention Chinese martial arts (wushu) as a way to effectively face challenges of modern living, such as health issues, psychological problems, interacting with street hooligans, and so on; state that martial arts is extremely beneficial for human health. II. First argument. Physical shape and health. 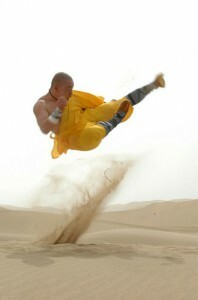 – Draw readers’ attention to stunts that can be seen in movies about martial arts. Claim that achieving a physical condition needed to perform these stunts is possible for everyone. – State that all martial arts schools pay attention to physical development, since one’s body should be physically able to easily perform moves of certain fighting styles. – State that many fighting styles were developed not only to inflict injuries to opponents, but to contribute to the physical health of the practitioner as well. Mention tai chi quan as a bright example of a recreational martial art. – Show you are aware of alternative points of view, claiming that martial arts can be traumatic and thus do not contribute to health; claim that not only martial arts, but all kinds of physical activities (jogging, for instance) should be performed with caution. – Present the statistics of how often people get attacked in the streets, and how many crimes are committed per day in a metropolis such as New York City. – State the necessity of being able to defend oneself. Find and introduce the approximate time needed to study the basics of the most popular martial arts styles (wing chun, tai chi quan, xingyi quan) that can be used for self-defense. – Browse media resources to find information about cases of individuals that are competent in martial arts and have defended themselves or other people from multiple attackers. IV. Third argument. Hardening one’s spirit. – Mention the positive psychological effects of going into martial arts; state that martial arts help develop self-confidence, overcome various psychological issues, and helps an individual to discover new aspects of their personality. – Provide readers with a short discourse about the philosophy of yin yang and qi energy. – Show how skills obtained while practicing martial arts (patience, perseverance) can be applied in other spheres, such as everyday life. – Restate the thesis statement. – Briefly reintroduce the main arguments. – Mention that martial arts can be considered a cultural heritage of human civilization, not only of Chinese people.